There are a lot of things about this mantel that bothers me – but since I think I’m a nice guy, I am going to preface my comments by saying that the person who put this mantel together is probably a nice and talented person … but this mantel is not for me. In addition to asking you to ignore the numbers in that picture (I didn’t create them), I’m going to ask you to ignore the fact that this isn’t even a fireplace. Simply put, the scale and proportion of this entire fireplace surround and mantel are wrong, and the style is something I really don’t care for. Everything about this fireplace, all the visual clues (except the brick and the surrounding furniture) would lead me to believe that this non-fireplace is humongous. I will confess how I found this image: I went to Google and typed in “Fireplace Mantel DIY” … of course it’s a DIY mantelpiece. You can probably figure out for yourselves where I found the image. So let’s move on to the mantel surround that was just installed at one of my projects – it’s got some size and scale-defying trickery going on as well – hopefully, the good kind. This fireplace is an Isokern ‘Magnum’ fireplace from Earthcore. We use a lot of these types of fireplaces because they come as a kit of parts and we have some flexibility over the finished size/opening. 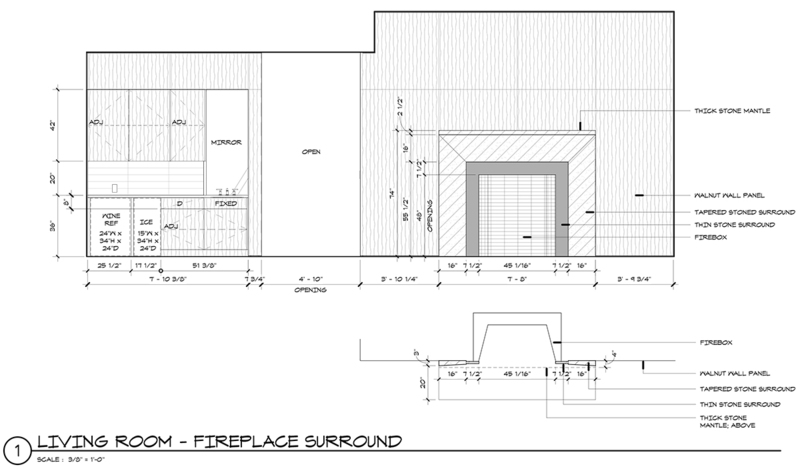 Am I really so fussy that I need custom sized fireplaces? Yeah, I kinda am that fussy. I am including the picture above because it has a scale figure in it … Ryan. I don’t actually know how tall Ryan is, but I am going to put him in the 5′-10″ range when he stands up straight. Rather than try and run down all the particular dimensions of this room and that fireplace, I am going to include an elevation drawing of this exact view, complete with dimensions down below. Here it is [click to enlarge]. The ceilings in this main living room are 12′-0″ and the walnut paneled portion of the wall where the fireplace is located is 15′-4″ across. This is a big wall and in order for our fireplace and mantel to be simple AND have a role of prominence on the wall, the scale was really important. Another constraint we were working around was the maximum width of walnut paneling that is on the wall with the fireplace. This is an enlarged look at the stone profile that surrounds the fireplace. As you can see, there is a slight taper to the stone – it’s not much, it goes from 4″ down to 3″ across the 18″ width of the face of the stone. We have also inset a complimentary stone within the mantle surround to help with the scale. So here’s a look at the newly installed fireplace with the walnut panels finished and the stone mantel set in place. The first thing I notice about this wall is that the scale of the fireplace, at 6′-2″ tall, doesn’t look as tall as it really is. Let’s do an experiment, if it isn’t already too late. Try and imagine just how tall someone standing next to that fireplace who is 5′-10″ tall. Got it in you mind? How did you do? At 5′-10″, that scale figure represents the height of the average American male (my apologies to other countries that aren’t where this project is located). If you are someone who designs for a living and is used to thinking about scale and proportion, I’d guess you did alright. When I brought the office by the job site for a field trip, pretty much everyone was surprised by just how big that fireplace and surround was – even when they were standing in this room while moving from one end towards the fireplace. It wasn’t until they were literally standing right next to the fireplace did the actual height really come across. I found that immensely rewarding. Here is a look at the mantle from the side. As a brief anecdote – the stone fabricator was worried that the chamfered profile, coupled with the length of the top piece, would be prone to breaking during fabrication. We did end up making some slight tweaks, (we reduced the amount of the chamfer) but I really thought this particular design should stay in place. It had the right balance of scale and simplicity but delivered the impact I thought this main wall required. And finally, a close-up look at the mitered corners of both the leuders limestone and the interior gray 3cm Basaltina slab. It’s hard to see in this picture, but if you look really closely, you can tell it’s there. The contractor hasn’t mortared the leuders yet in case you were wondering … the gaps are not part of the design. I’ve said it before, but it bears repeating: Size, scale, and proportion are where a good architect makes their living. There are all sorts of devices that have been developed to help designers determine how best to guide them in their creations … the Golden Section, the Modular, the Canons of Proportion, on and on. I typically don’t use any of these devices choosing instead to rely on what looks right to me. People wonder why I sketch as much as I do when I am designing, arguing that working in Revit or AutoCAD is soooooo much faster. I don’t do it for speed, I sketch because it helps me work through scale and proportion.